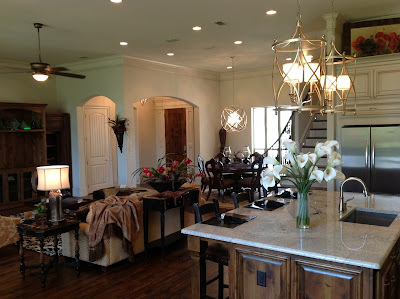 Decor Brought to Light: Traditional or Transitional - Let's do both! Traditional or Transitional - Let's do both! 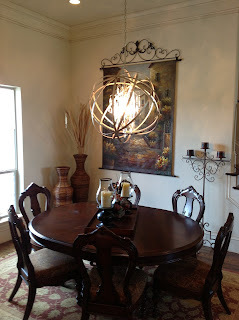 People are always asking me - "What style is this chandelier? Traditional or Transitional?" Lighter wood cabinetry with cleaner lines can be mixed with darker distressed floors, and transitional lighting fixtures and finishes can be blended together in a home filled with traditional furnishings, creating a very current design. Don't be afraid to love more than one idea at a time!! I truly believe that today's homes are filled with many different designs - and labels are unnecessary. Do you like it? Is it special to you? Would you enjoy waking up each morning and seeing it in your home? If the answer is yes, then there is a way to work it into your design. We love a moment of surprise in the room - bringing in a bit of fun and whimsy can do wonders over the dining table you have had for the past 8 years. Think out of the box - look at different finishes, there are so many to choose from! The beauty of today's design world is that it doesn't all have to "match". That's why faux finishes are so wonderful. They play with different color tones and textures, and allow for a mix in the room. On the flip side of that coin....... If you prefer contemporary furnishings - don't be afraid to step out of your box and add a little "bling" to the space. Yes, that's right - Think about adding crystal to the mix!! Sure - there are tons of contemporary fixtures with very clean lines and stern structures, but that's almost too easy! When we say "step out of the box" we mean REALLY step out!! Remember, ultimately - it is your home and variety is the spice of life! Thanks so much to Providential Custom Homes, Deb Dutton of Duttro Designs and JPJ Designs for allowing us to showcase their spaces!! We look forward to the next opportunity to bring their decor to light. As always, thanks so much for the "read" - have a Blessed day and we will Light It Up again next time!! I agree with your statement about not being afraid to step outside the box. I think every room should have something that is a signature statement. Beautiful chandeliers in your pictures! Very unique. Lots of selection on your website - too bad I can't stop by the showroom. If I'm ever in Texas, maybe I can stop by! Even though you can't come by in person we will be glad to help you in any way we can. Technology has made it so that with email and digital pictures we can usually answer questions and provide solutions in a virtual manner. Love this article. I cannot wait to start a new change. Thanks for the article. You are very welcome! Let us know if we can help in any way! !